This review is for the XBLA version of Spelunky. There is an extremely similar free version online, but this critique pertains to the specific changes made for the console release. Most great things are difficult to qualify in words. You can tell somebody that the Mona Lisa is a great painting of an ugly lady, or that Blade Runner is a great movie about robots, but that does nothing compared to watching Rutger Hauer deliver his final soliloquy while slowly deactivating in the rain. It’s not solely what something is objectively that’s important, its the lasting effects of experiencing something that make it impactful. 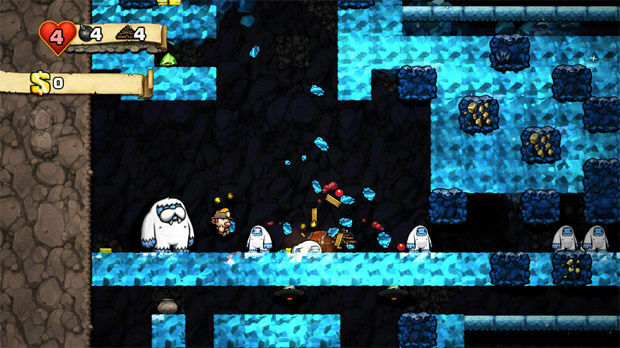 With that said, Derek Yu’s long-worked-on Spelunky (there’s a free version online showing just how long it’s been tweaked) is not simply an indie platformer hell-bent on crushing your spirit, even if sometimes it’s hard to see past that. In Spelunky, you are (surprise!) a cave diver, exploring the various worlds that exist deep underground with basically no backstory. The game is a Rogue-like, meaning each time your character dies, you start over from the beginning. These games are for people who greatly enjoy the mechanics the game offers and are genuinely excited to spend hours/days pushing further and further into the games world in hopes of getting further than ever before. At the beginning, there is some vague mention of your Father’s final words, but its really inconsequential. You enter into the first world, a decievingly straightforward mineshaft, with nothing more than your trusty whip, a few bombs, ropes (allowing you to scale vertically). Oh, and a whopping 4 hearts, granting you the ability to be hurt a maximum of 4 times. As you guide your cute little explorer deeper and deeper, you will have enemies and obstacles placed in front of you that you must overcome using a wide range of tools that can be accessed via randomly placed crates, shopkeepers, sacrifices to the great god Kali (yeah) or from defeating more difficult boss-like enemies that may appear in the world. To go into detail about all the nuances of the game would be to ruin what the great sense of exploration the player feels when accidentally stumbling onto something new, so I won’t. All you need to know is you start at one point and work towards the door at the end of the stage. The game consists of 4 areas each with a unique theme (mines, jungle, iceworld and temple), each area consisting of four levels. Get through the 4 levels, and you make it to the second area. Doing so, however, does not mean you’re in the clear. You are not granted any additional life, and if you die, you still start from the beginning of the first area. Unless, that is, you create some shortcuts. Waiting at the end of each area lies Tunnel Man, a friendly-yet-demanding NPC that tasks you with collecting certain items so he may build a tunnel. Building a tunnel will allow you to bypass re-playing through previous areas to begin latter ones. Sounds fairly easy, right? I thought so too. Collecting the items Tunnel Man asks of you is one thing, but surviving to the end of the area with them can be truly maddening in a world that does its best to throw every possible hiccup into your seemingly well constructed plan of attack. While on the surface level, the game is based around the basic platforming mechanics every gamer of a certain age has played a million times over (its not even the first to do so with the cave-diving theme, see: Spelunker) it is the randomized events that create experiences unique from play to play. The fun gameplay couples with an excellent retro soundtrack and precise controls to create an exhilarating series of adventures. And even though a lot of these adventures ended in my simply landing in spikes existing off-screen just moments ago, there were many times that my individual playthrough seemed to be creating a narrative of it’s own. There exist short, beautiful moments of triumph that leave you thinking breathtaken and confused, wondering how in the world you managed to vault over a slew of enemies steaps ahead of a man-crushing boulder with a damsel in your arms. It is these moments that provide the payoff that has Spelunky fans returning death after death. And while it’s fairly inconsequential (and a good way to lose a close friend) the multiplayer included specifically for the XBLA version, turned out being a lot of fun for small periods of time. Older gamers look back on the golden years of gaming with deep nostalgia for many reasons, one great one being that the internet hadn’t yet become a factor. People spent hours upon hours searching for/randomly discovering well hidden secrets the developers had put in. I know I remember being amazed when discovering the hidden pipes in the original Mario, and that game had been ripped apart for years before I ever touched a controller. Indie games over the past few years have done an exceptional job of including such secrets in their new games. Fez, released earlier this year, had the internet in an uproar trying to figure out the insanely complicated secrets that changed that game from a straightforward platformer to an interconnect mindfuck. Spelunky also has it’s share of hidden systems and mini-goals for players to seek out. While I won’t ruin them here (they’re easy enough to find on the internet if you, like I did, don’t wish to spend the time discovering them for yourself) but they’re a great addition to the games’ already strong core. Spelunky doesn’t have a death count, but if I had to ballpark it, I would expect I’m somewhere in the 300 range, which is a strong testament to it’s strength. It’s unique blend of brutality and fairness covered in a kid’s game sheen is a theme that has had a serious return in the downloadable titles of recent years. None of the others, however, offer up as maddeningly addictive of an experience as Spelunky’s ‘embrace death and rise above it’ style. What’s important is not how many times you throw down your controller in anger, it’s how quickly you pick it back up. Play it.